Imagine this: You are sitting in a Chip’s Family Restaurant waiting for your breakfast to arrive. You spot the server striding toward you, delicious food in hand. Your stomach is grumbling, your mouth is watering, you cannot wait to dive into your fluffy stack of pancakes. You’re about to dig in when suddenly you remember, “I have to take a pic for Instagram!” As cringey as it may be, we are all guilty of posting food pictures. It’s fun to ignite jealousy in your followers as you show off what you’re eating to the world. At Chip’s we don’t judge. We encourage you to take the snap for insta, so we have compiled 15 eggcellent breakfast puns to use as captions. Post away! 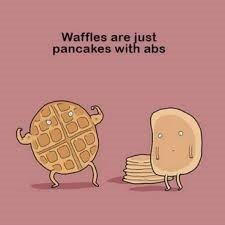 I like you a waffle lot. If Shakespeare cooked breakfast, he’d make a Hamlet. Don’t go bacon my heart! I couldn’t if I fried! Look to the sunny side! A toast to a beautiful day! No one stacks up to you! Chip’s Family Restaurant serves breakfast, lunch and dinner to customers in Fairfield, Orange, Southbury, Trumbull, Wethersfield, and our newest location, Southington, Connecticut. All our meals are homemade, breakfast is served all day, and we use local fresh produce. To visit one of our locations or view our menu items, please click on the tabs above.